THESE ARE THE CENTRE HUB CAPS AND NOT THE FULL WHEEL COVER. THE PICTURE SHOWS THE ABSOLUTE MINT CONDITION OF THESE HARD TO GET ITEMS. SEE MY OTHER LISTINGS IF YOU WANT LESS THAN FOUR. THEY QUALITY OF THESE ARE STUNNING AND WOULD SUIT A SHOW CAR. YOU WILL BE "DELIGHTED" OR A FULL REFUND IS OFFERED. 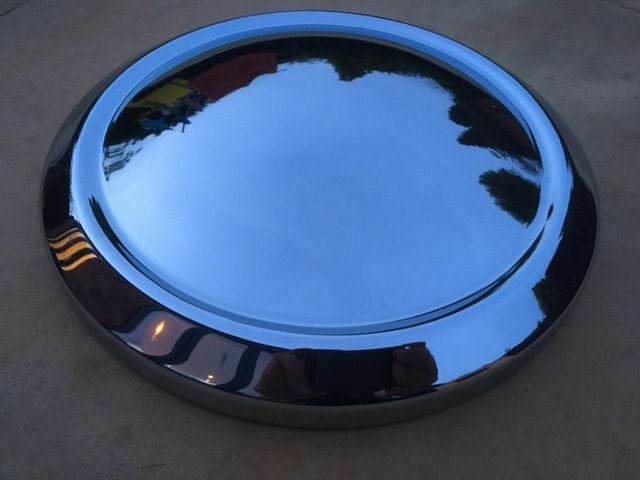 I AM OFTEN ASKED HOW CAN WE SELL OUR CHROME FAR LESS THAN THE REST ON SALE. IT IS SIMPLE. OUR PASSION IS KEEPING CLASSIC CARS ALIVE AND WE WORK ON AVERY LOW MARGIN WITH NO FANCY WEBSITES OR EXPENSIVE OVERHEADS, TO GIVE YOU THE BEST DEALS POSSIBLE. THE ITEMS ARE TOP QUALITY MOST OF WHICH IS MANUFACTURED IN HOUSE BY US. WE DO NOT OFFER PRICE MATCHES OR MAKE SILLY COMMENTS ABOUT OTHER SELLERS. WHAT YOU SEE AND WHAT YOU GET IS PERFECTION OR YOUR MONEY BACK.